Welcome to 1830 Bloor Street West, an elegant one-bedroom, one-bath in the exclusive Daniels High Park Condominiums. This impressive, open-concept corner unit features beautiful quartz countertops in the kitchen and bath, hardwood floors throughout, and a large balcony. The chef’s kitchen boasts a unique style of island that doubles as a four-person dining table—perfect for everyday dining or easy entertaining. The Daniels building has 18,000 square feet of unparalleled indoor and outdoor amenities: cardio and weight studios, sauna, double-height rock climbing wall, indoor/outdoor yoga & Pilates studios, big-screen home theatre, party room, billiards room, indoor/outdoor fireside lounges, catering kitchen for large group entertaining, outdoor terrace with barbeques, and rooftop gardening plots. There is a 24-hour concierge, locker and bicycle storage, and unique resident bike engagement and bike share programs. Located directly across from High Park and with a 24HR grocery store on the main floor and steps from two TTC stations (High Park and Keele), this location couldn’t be better. It’s walking distance from GO and UP transit, and the Gardiner Expressway is easily accessible. 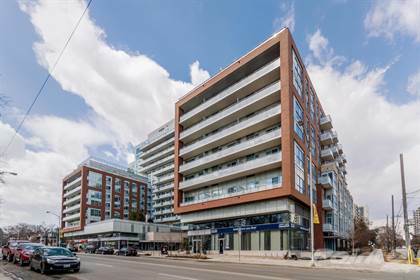 With a Walk Score of 85, this building is ideally located within a short walk of three sought-after neighbourhoods: Bloor West Village, the Junction, and Roncesvalles. With beautiful finishes, enviable amenities, and an unbeatable location, this rarely available unit is 620 square feet of light-filled, superior-quality living. Hi, I'd like to find out more information about 1830 Bloor St W . Thanks so much!